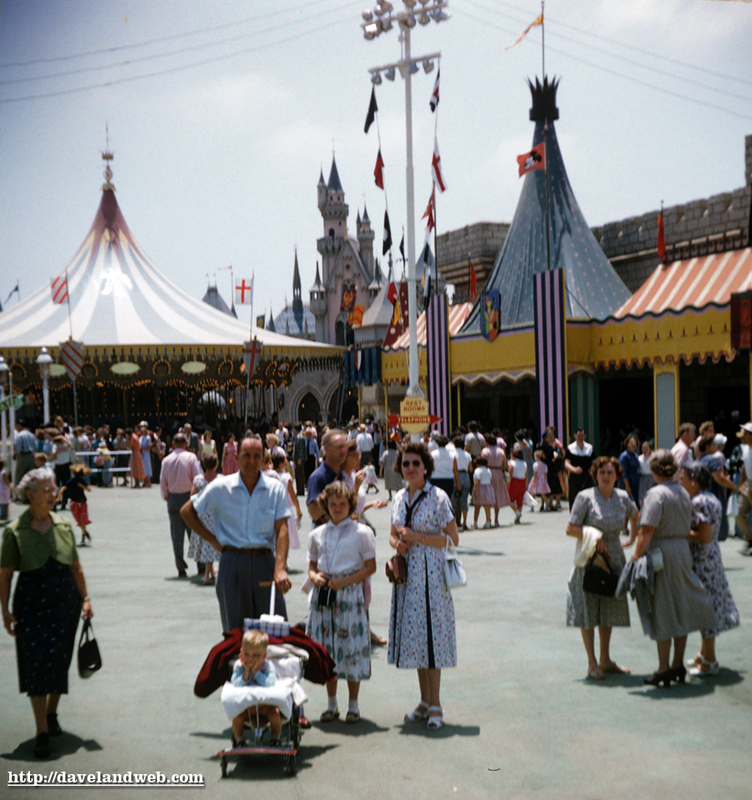 A few more July 1955 Fantasyland shots for you; shot 1 shows the Carrousel (that’s 2 “r’s” at Disneyland!) 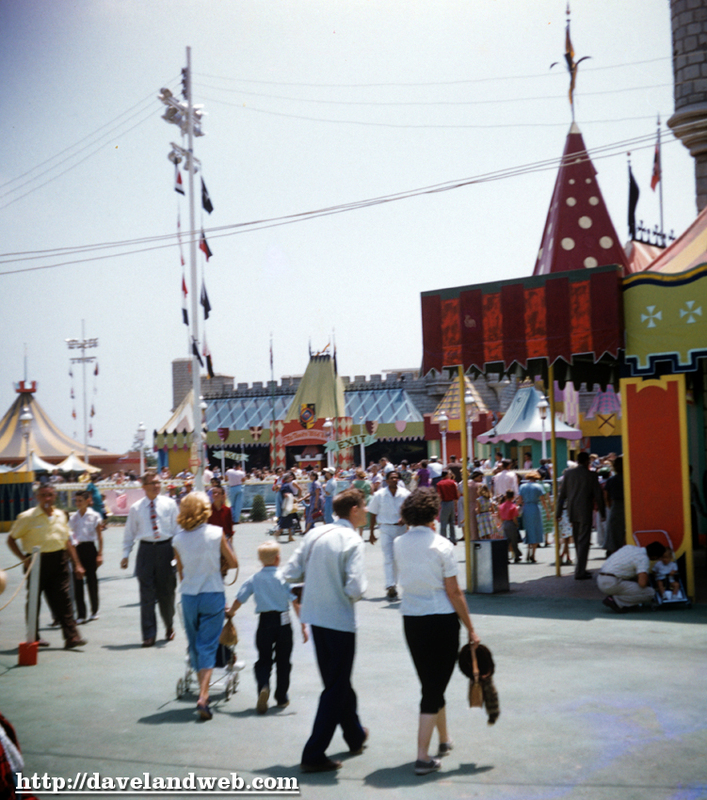 and the Mickey Mouse Theater, which wasn't actually open until August. 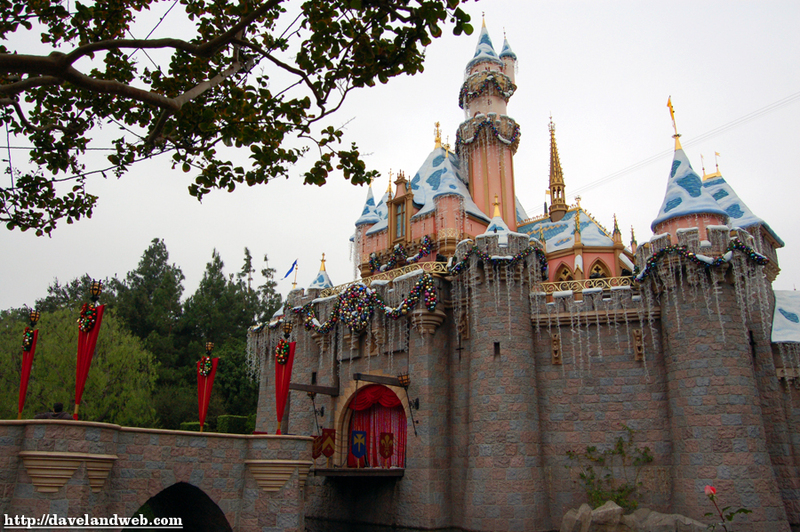 This was also the official Mickey Mouse Club Headquarters for Disneyland until 1963. View #2 shows Mr. Toad, which WAS open on opening day. Looks like the little tyke on the right is getting a stern talking to! 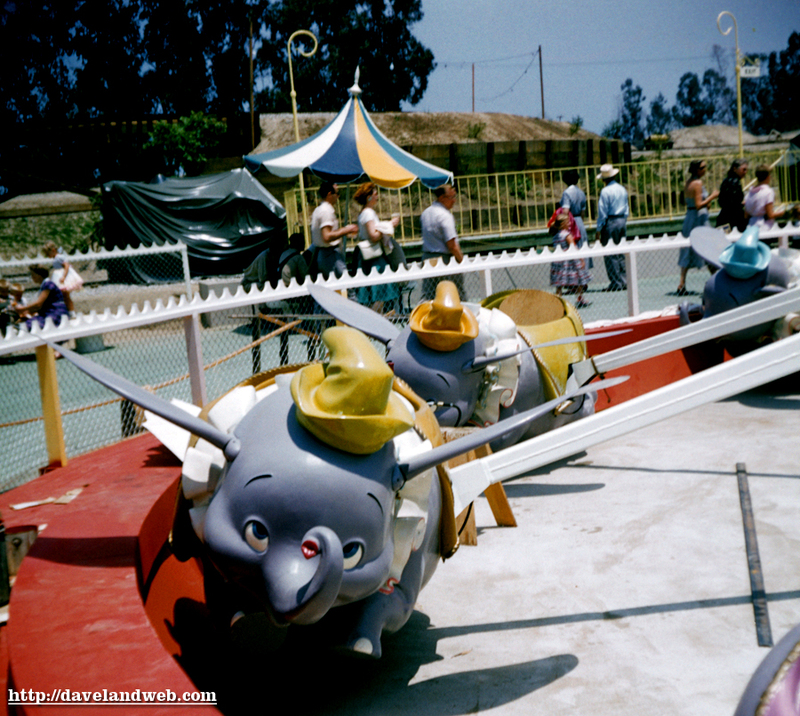 July 1955 is when this Dumbo closeup was taken; you can even see into his bright red snout, and clearly view the original “flappable” ears that he used to have. 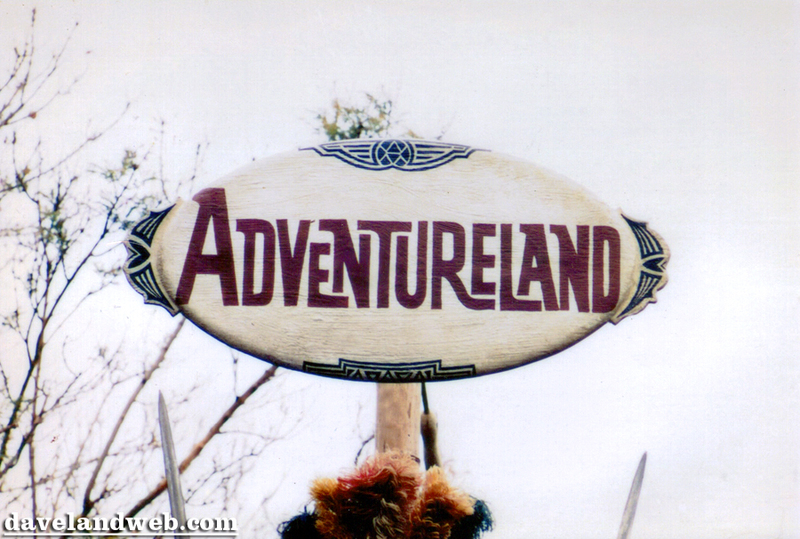 Storybook land is still a barren wasteland at this point. 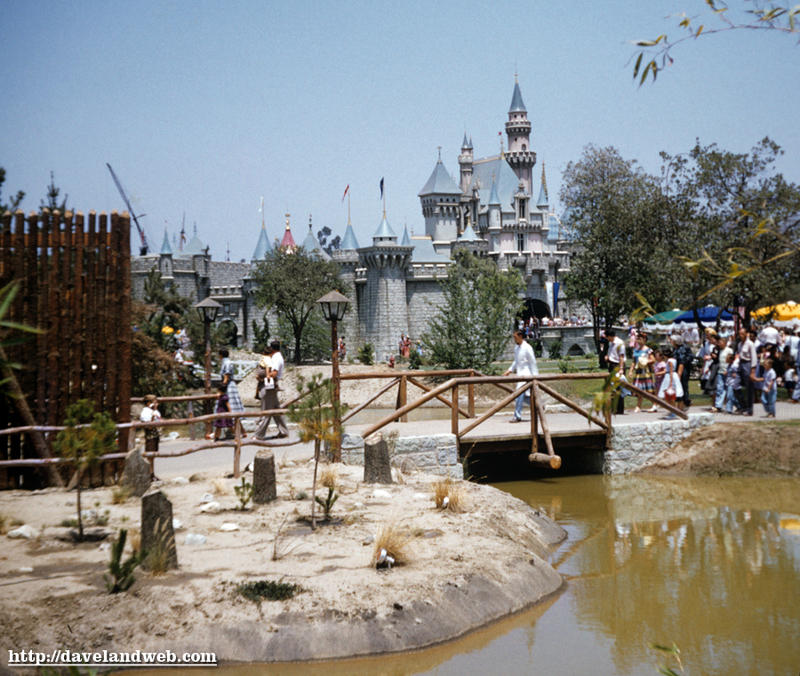 From the same batch comes this shot of the Castle and entrance to Frontierland. 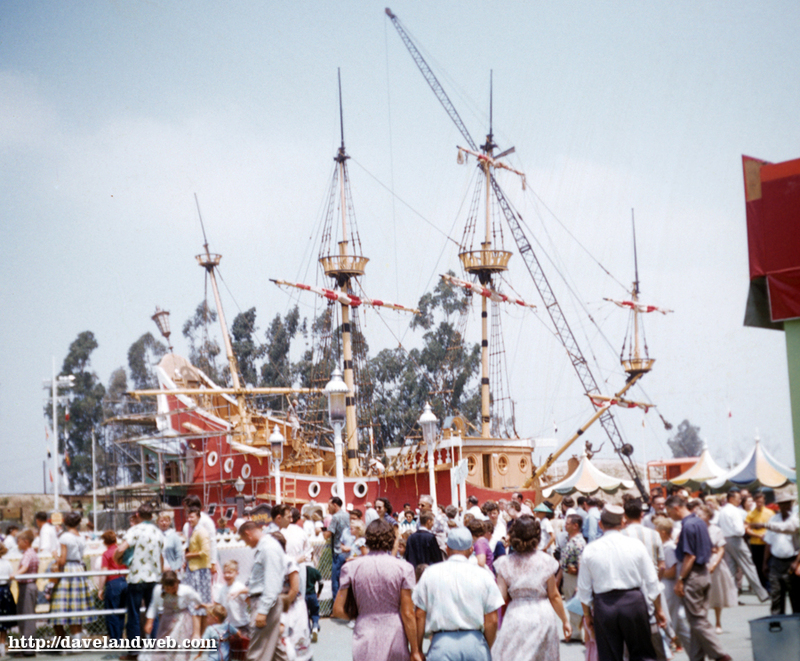 Here’s another image from July 1955; the park is open but there’s still construction going on at the Chicken of the Sea: scaffolding, and even a huge crane nearby. 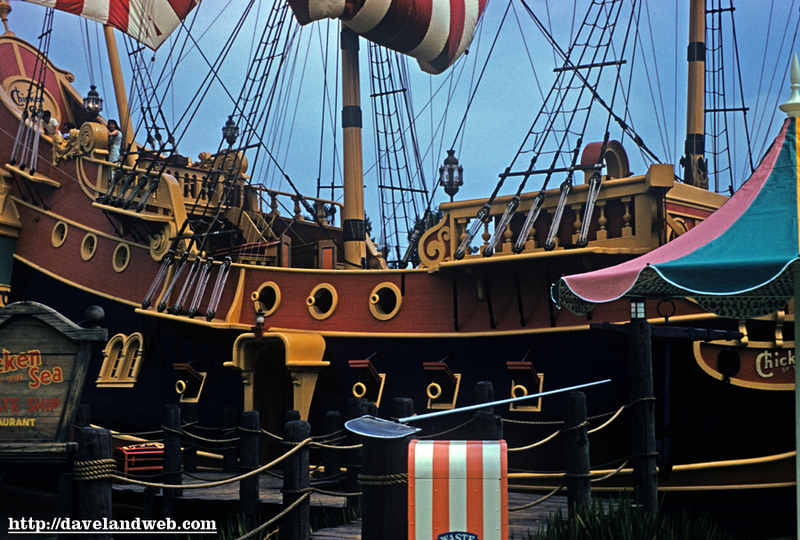 See more vintage and current Disneyland Chicken of the Sea photos on my regular website. 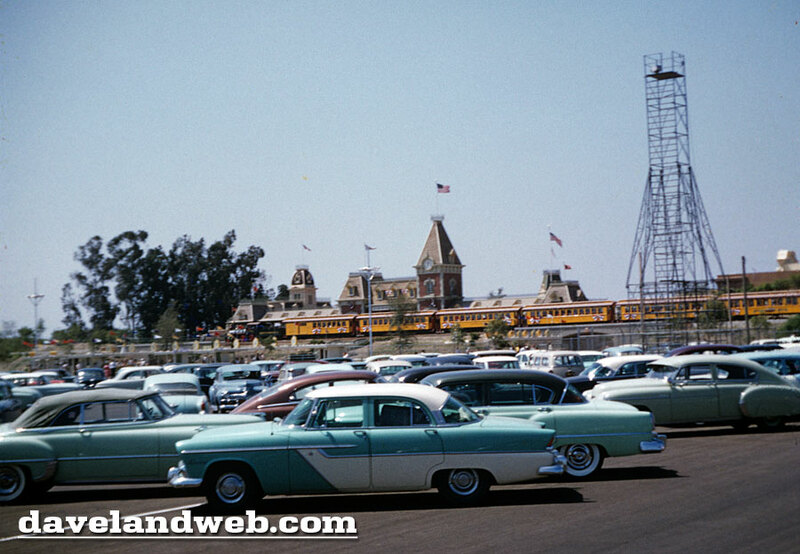 Shot #1 is from the same batch that Matterhorn helped identify as most likely being from July 1955; here we see a few passenger cars at the Main Street Train Station (the brick depot without any bricks!). 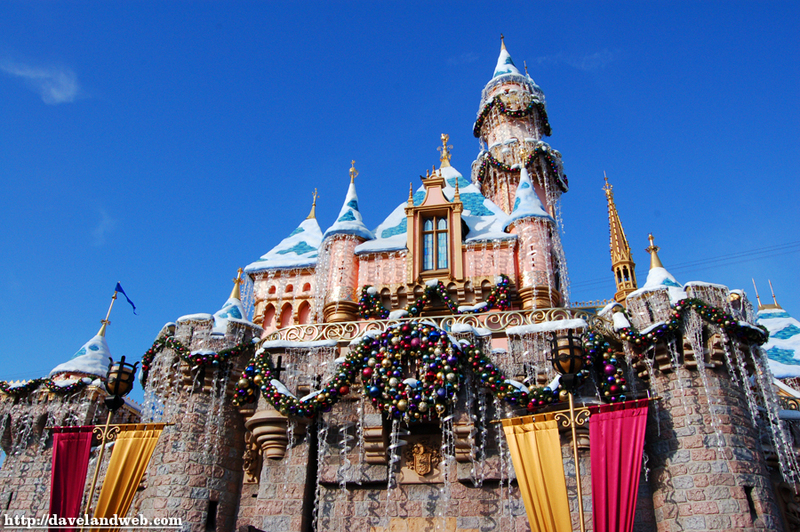 In my opinion, no trip to Disneyland is complete without at least one Grand Circle Tour around the park! Shot #2 is the E.P. 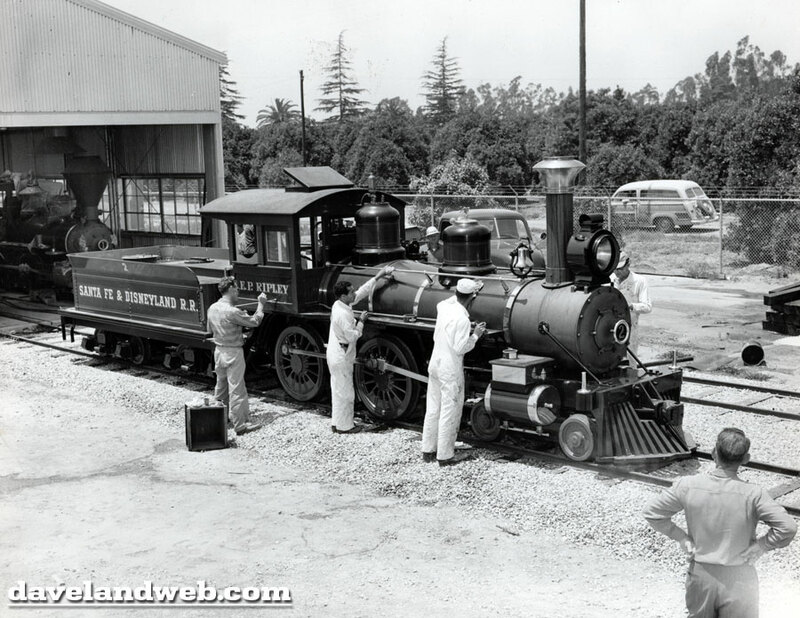 Ripley getting some finishing touches put on it, June 1955. Yup, Daveland is hanging out in the parking lot with the vintage cars today. This undated but obviously early view has a mystery tower on the right (ED. 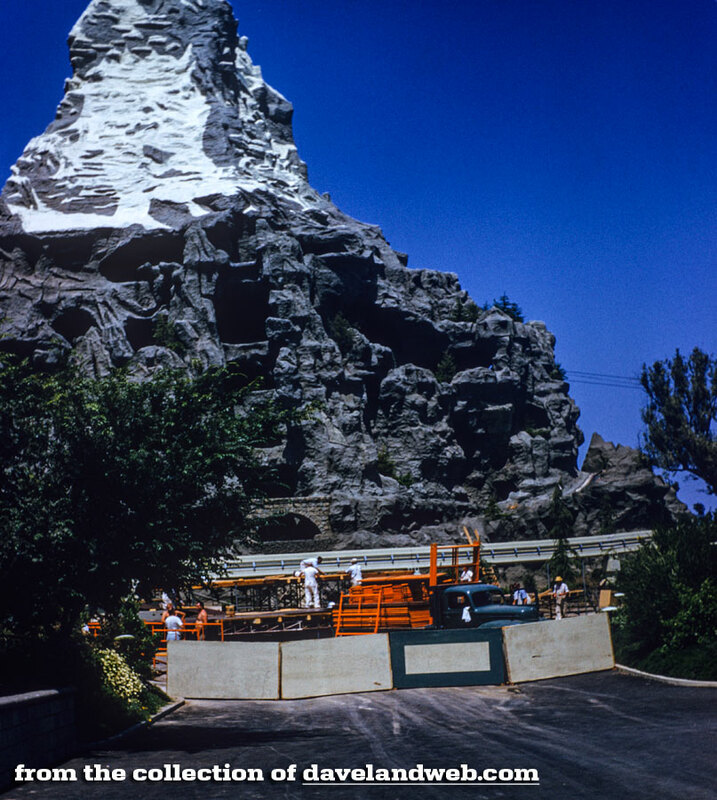 NOTE: Matterhorn has identified it as most likely being the opening day camera tower for filming of the festivities). The EP Ripley is awaiting its next load at the station. 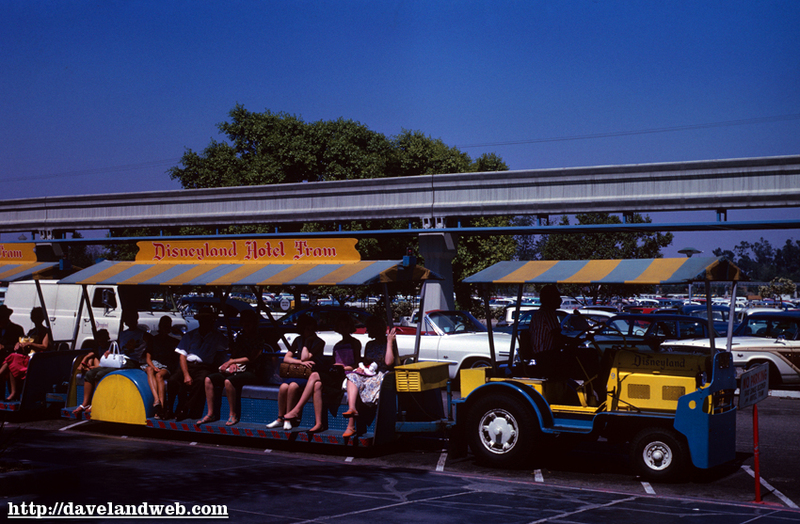 Shot #2 is from July 1963 and shows the Disneyland Tram, which looks like it should be pulling a hayride. Yet another ode to the lost Chicken of the Sea Pirate Ship (I wonder if there’s any buried treasure in the concrete underneath Dumbo?). 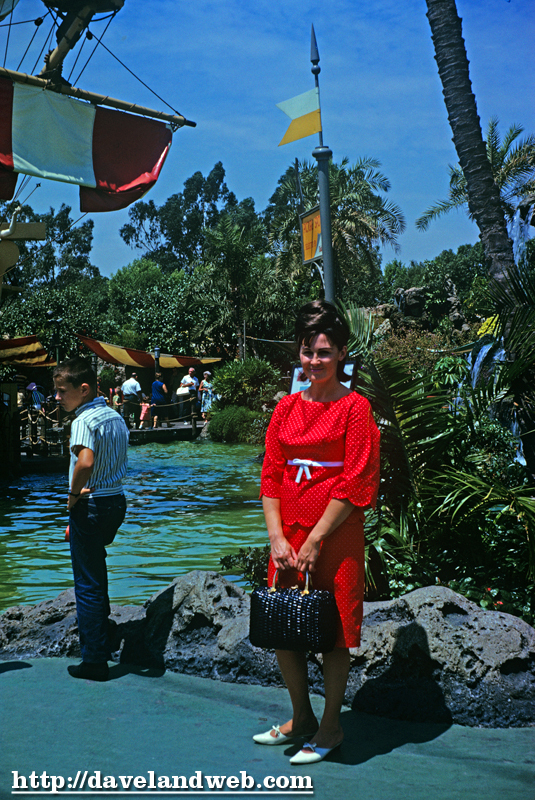 Shot #1 is from June 1959, and #2 with the pretty little bouffant-ed lass is from September 1965. 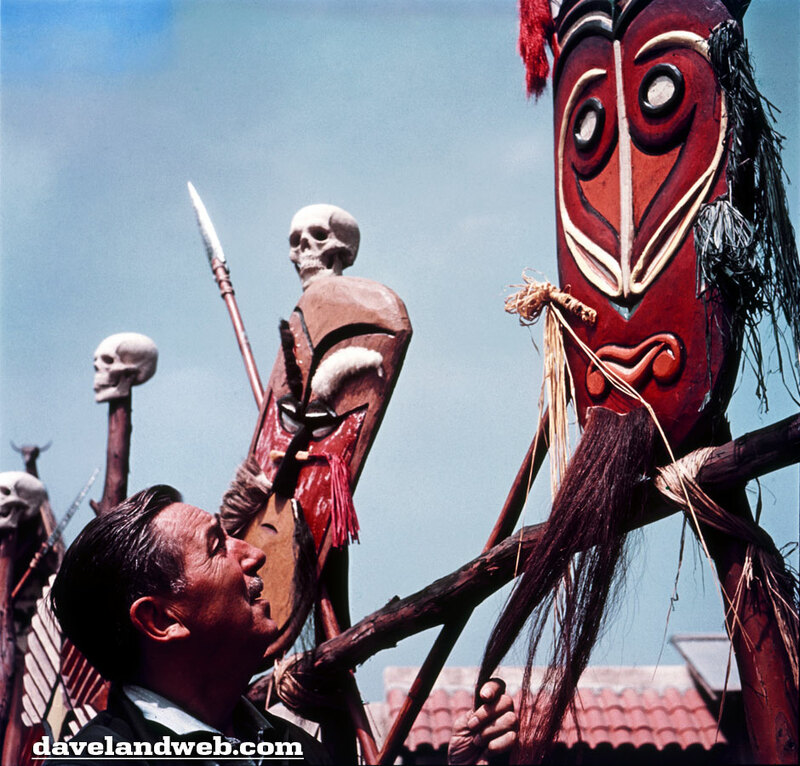 See more vintage and current Disneyland Chicken of the Sea Pirate Ship/Skull Rock photos on my regular website. “Winston! Come quickly! That’s SCARY Minnie! 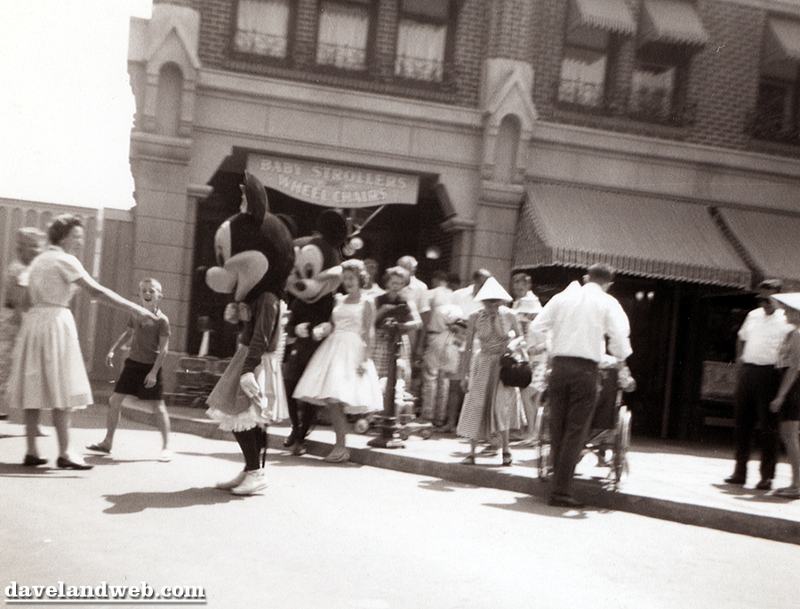 Let’s go!” Yes, it’s Scary Minnie; her costume was still somewhat frightening (in a Chuckie the Clown way) when this August 1960 photos was snapped. The Mad Hatter was still a Baby Stroller/Wheelchair shop. 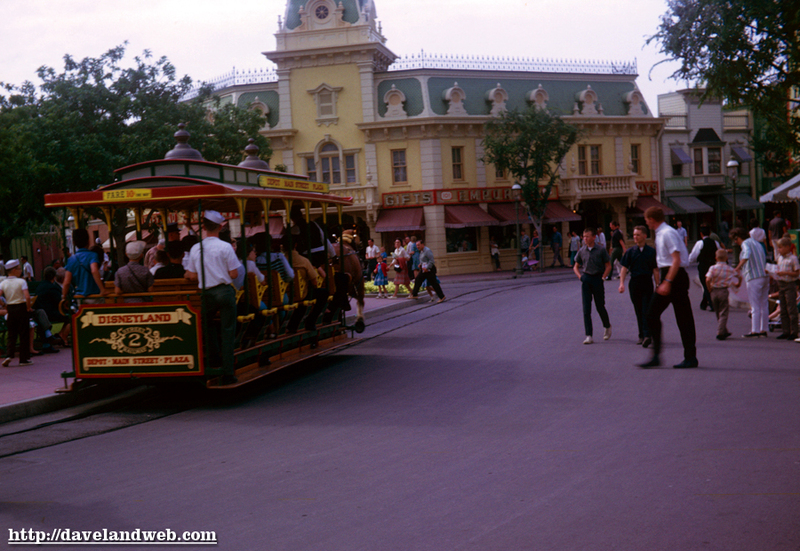 Moving back to color, we have a view of the Horse Drawn Streetcar from April 1963. Sailor hats must have been in, as I see at least 2 in this photo. 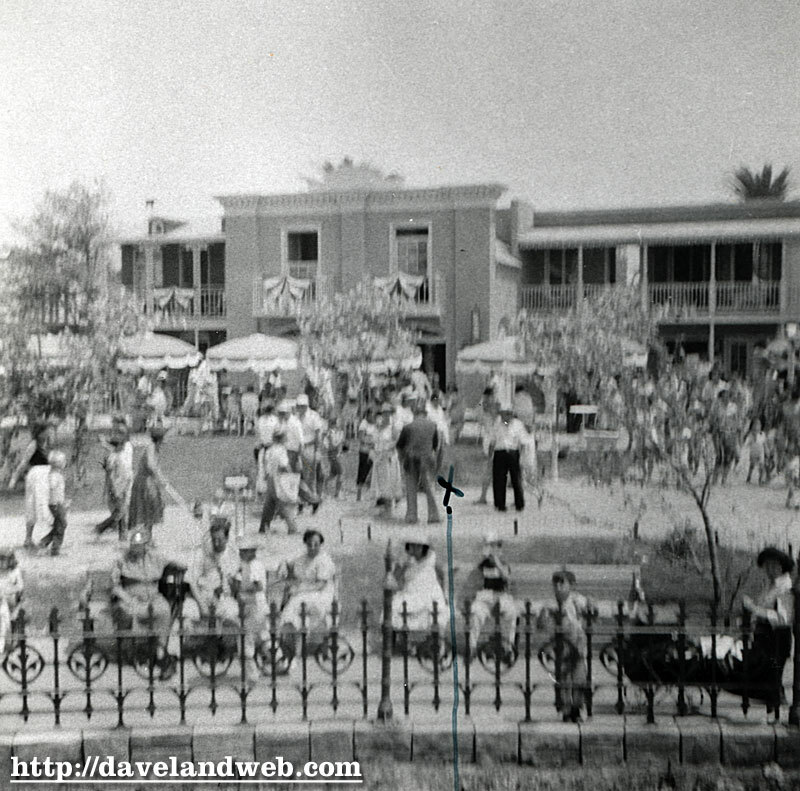 See more vintage and current Disneyland Town Square photos on my regular website. Except for the final 2 images, I believe I have posted all of these before. 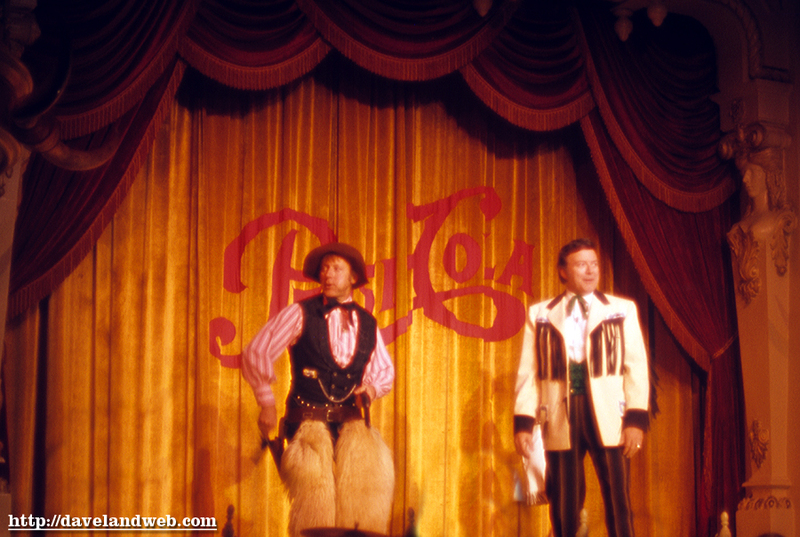 However, I thought with today being officially Leftover Day, what better way to celebrate than to do a retrospective of all my Walt-in-the-Park photos in semi-chronological order? 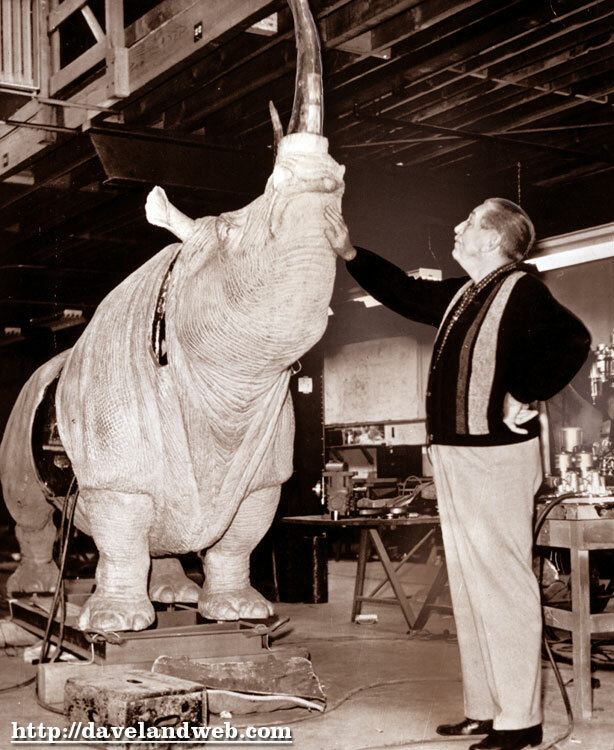 The man that was only behind the scenes in Disneyland creation, but also out front, selling the concept to America almost a year in advance on ABC television. Say what you may about him, the guy was brilliant. 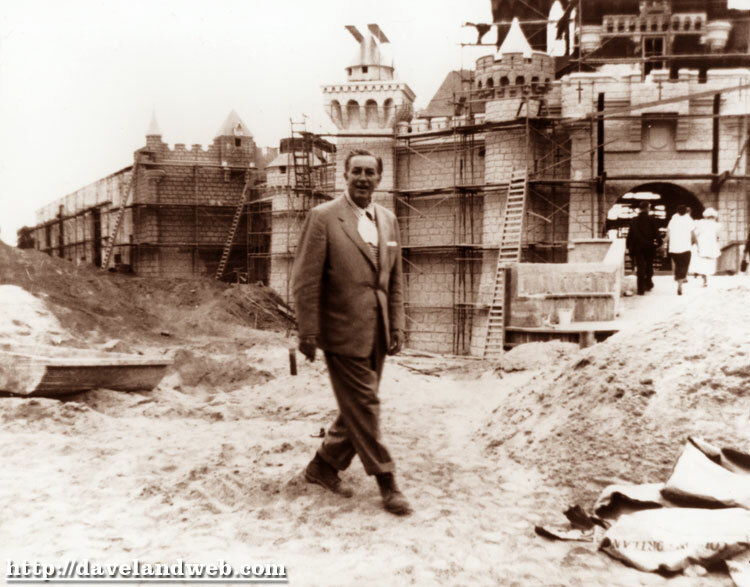 A few construction photos; I sure would love to hear the conversation going on here. 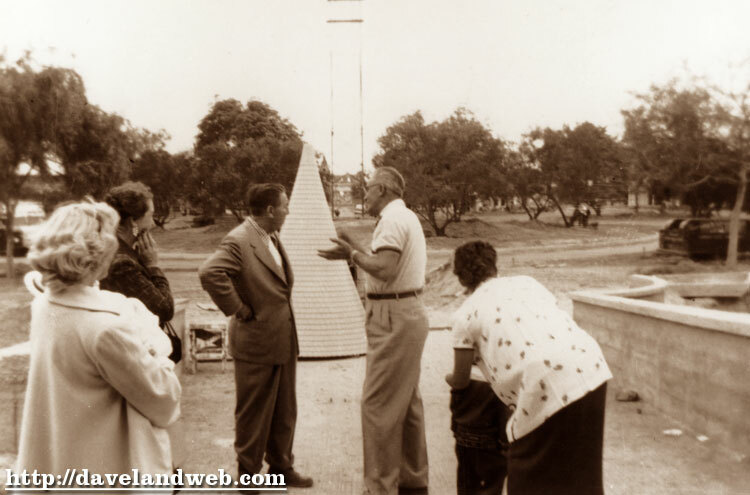 The poor guy trying to explain something, Walt not buying it, and the lady on the left with the “Oh dear!” look. You can bet that whatever was wrong was taken care of shortly after this talk. 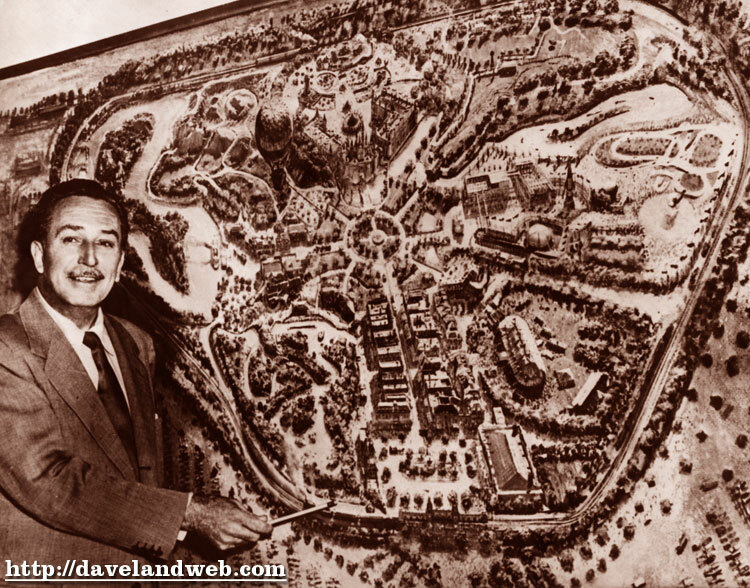 From July 27, 1955, Walt becomes the original “Waldo” as someone took the trouble to put an “X” near the almost unrecognizable back of the park’s creator. 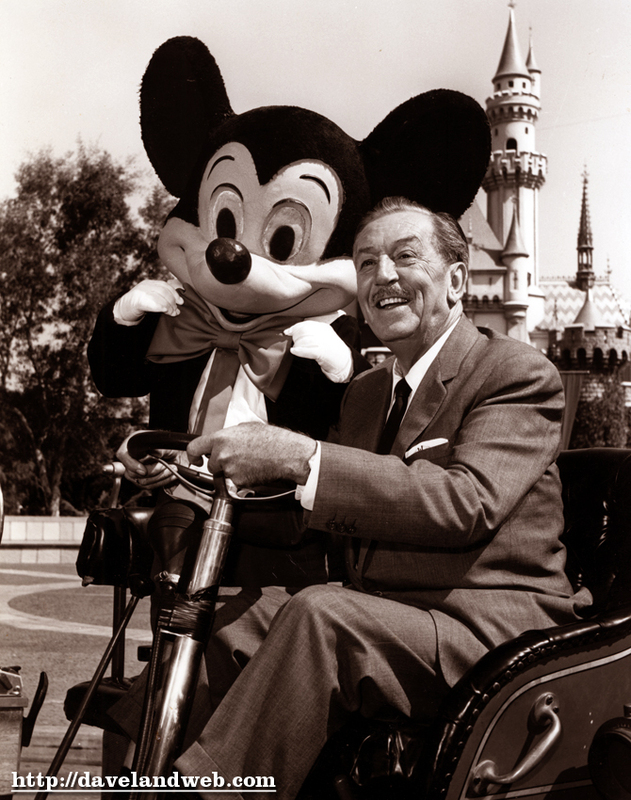 Walt & Mickey: Partners forever. 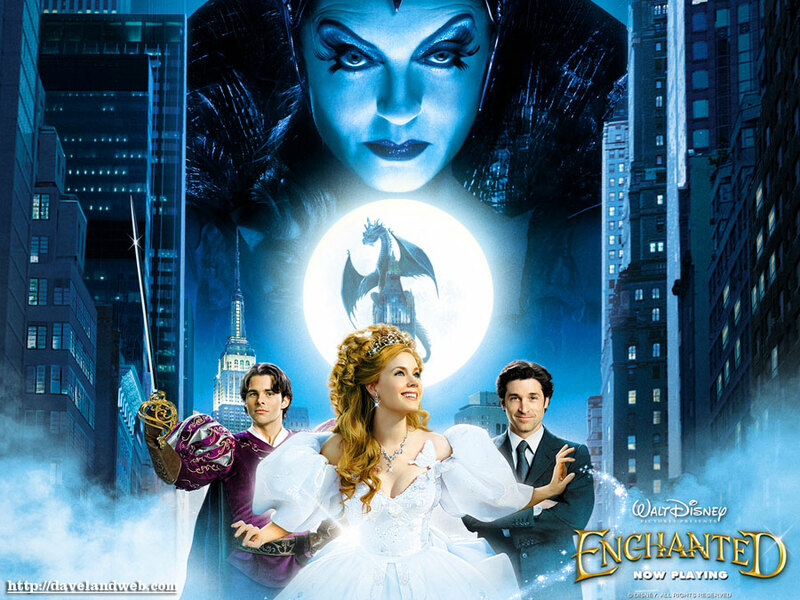 And on a different note...I went to see “Enchanted” yesterday, after the annual gorgefest on Turkey and the trimmings. I have been anticipating this movie more than any other Disney related film in years; the trailer looked promising, but trailers can often be deceptive. However, the actual movie delivers. Amy Adams is amazing as Giselle, a part that could easily have been played over-the-top and cardboard. Adams actually becomes a live-version of a Disney princess and you believe that she believes. Anyone who doesn’t enjoy this film needs to check their pulse. Kudos also to the songs; it would be hard to exit the theater without humming one or two of them. This is actually a movie that adults and children can enjoy together without the adults getting bored. Follow my updates on Twitter. 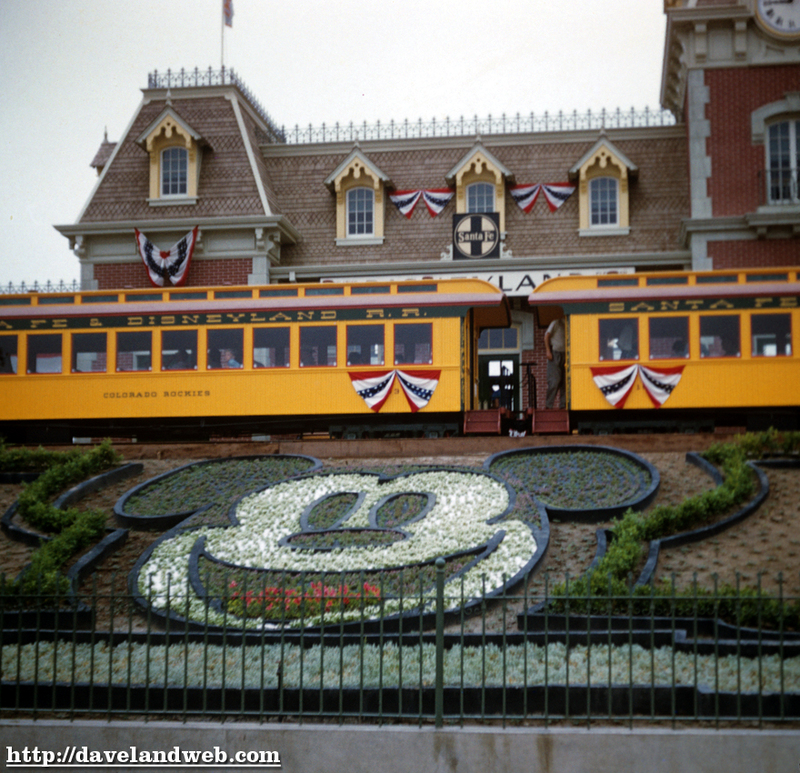 To see more vintage & current Disneyland photos, visit my Disneyland web page. For your Thanksgiving enjoyment I give you 5 (count ’em!) 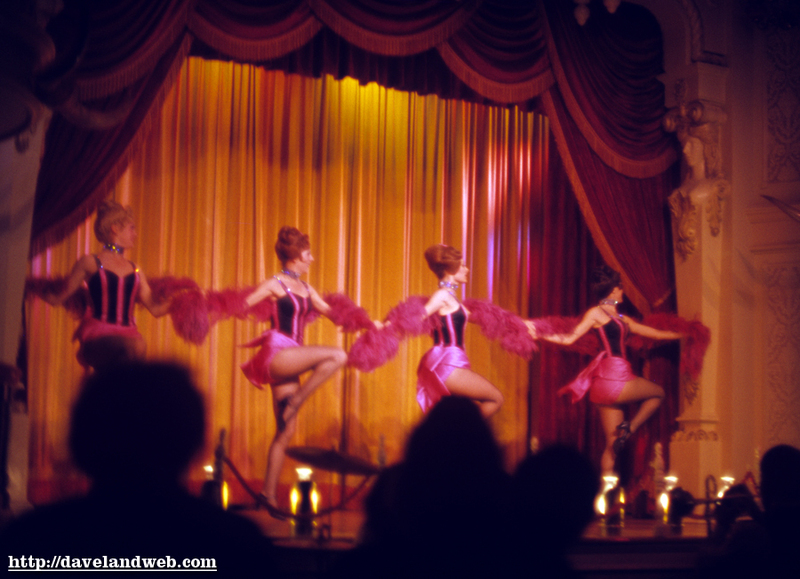 slides from an actual performance at the Golden Horseshoe, dated March 1976. 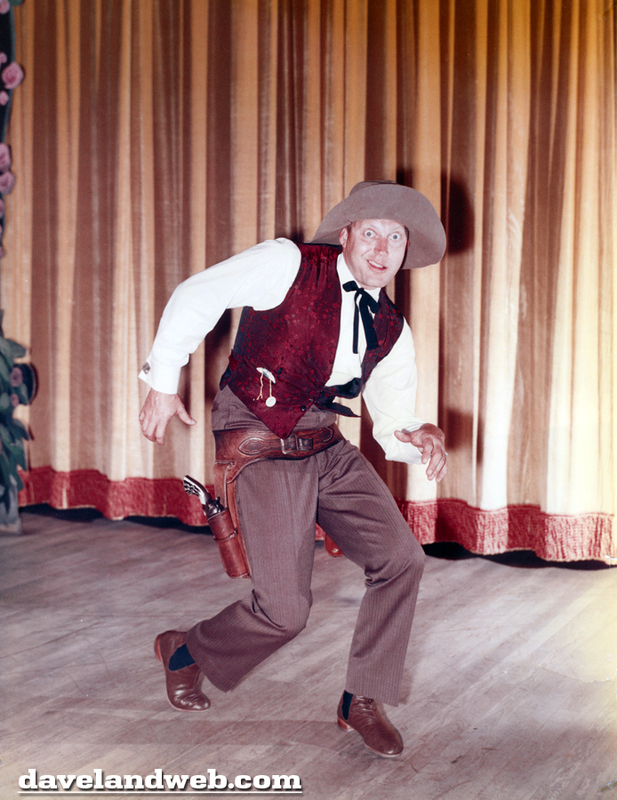 I believe that’s tenor Fulton Burley in the last few pics, who replaced Donald Novis around 1962. Be sure to check out the upcoming reunion show next March with Betty & Wally! Click here for details. Stayed tuned tomorrow as I present some images from an actual show. 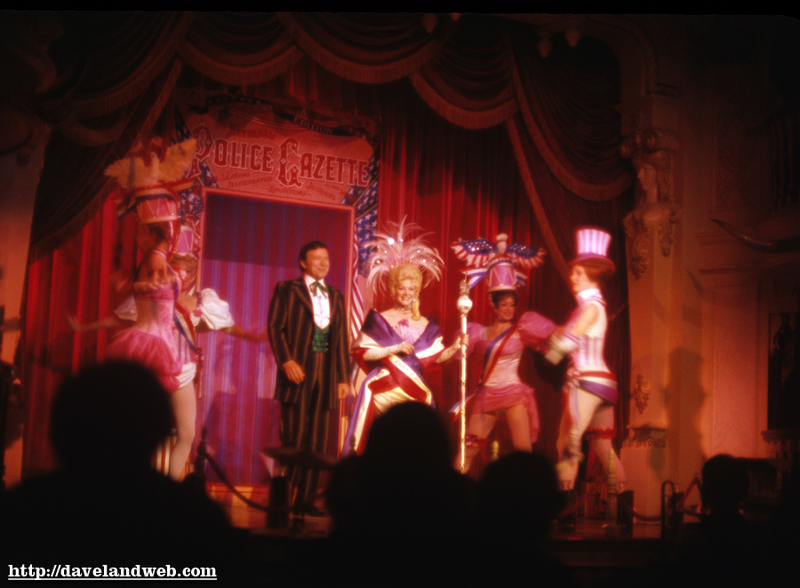 See more vintage and current Disneyland Golden Horseshoe photos on my regular website. 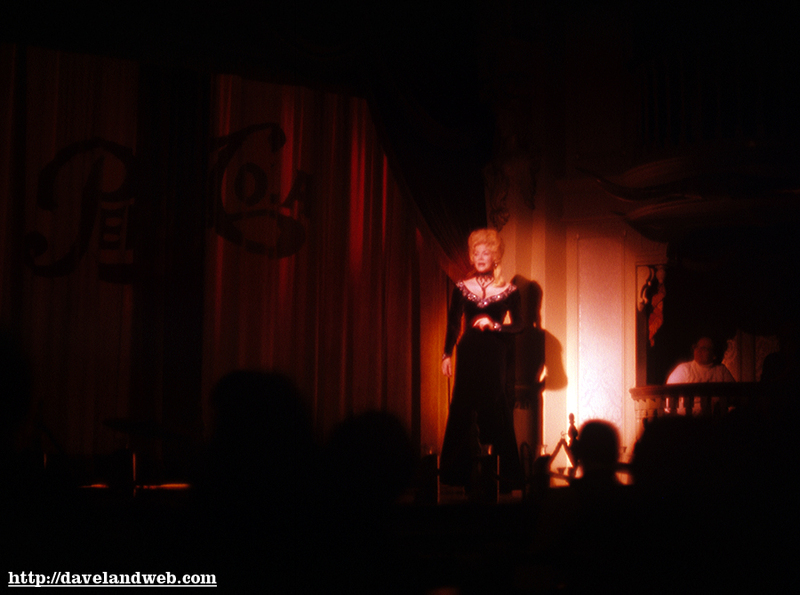 Here is a 2 part “series” with a few photos from the Golden Horseshoe. 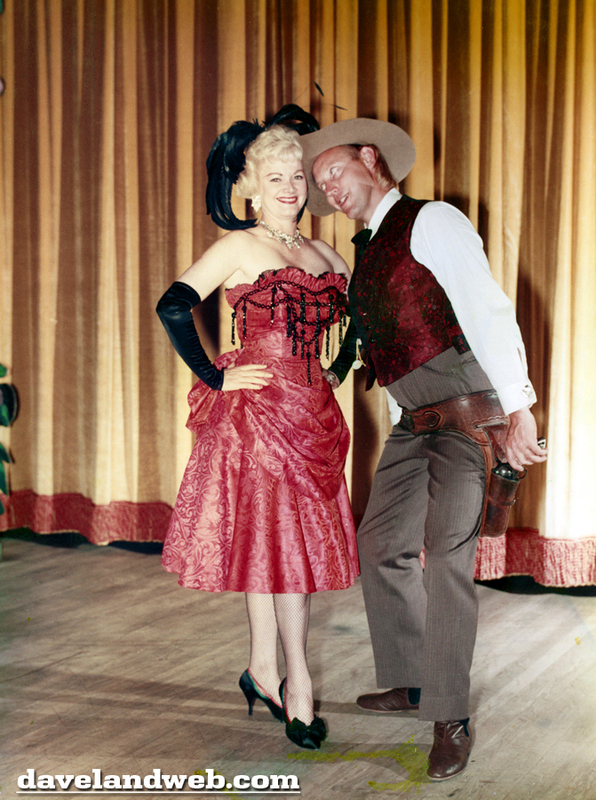 Today I present 2 1962 publicity stills featuring bug-eyed Wally Boag and Betty Taylor. Be sure to check out the upcoming reunion show next March with Betty & Wally! Stayed tuned tomorrow as I present some images from an actual show. 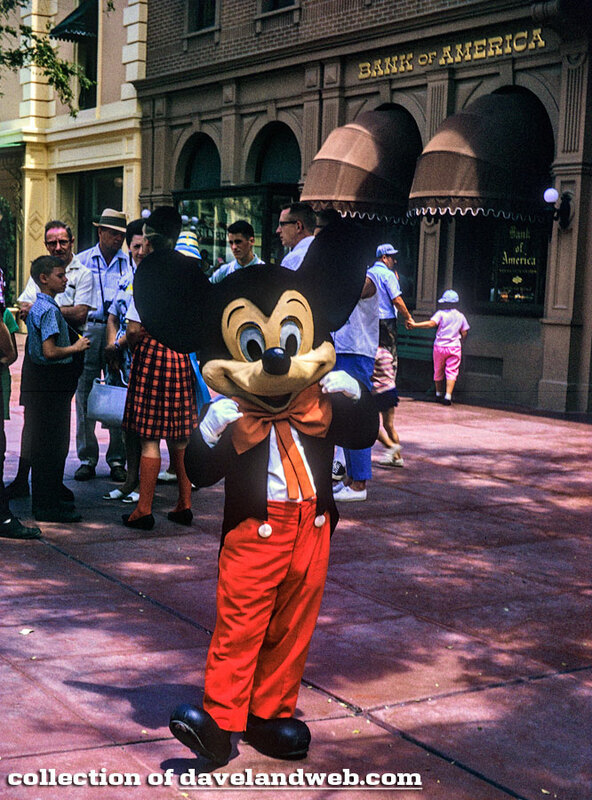 On a separate note...this photo was submitted to me by a reader who wanted to know approximately what year it was from; my guess is that it is from WDW and not DL; anybody able to identify where and when? 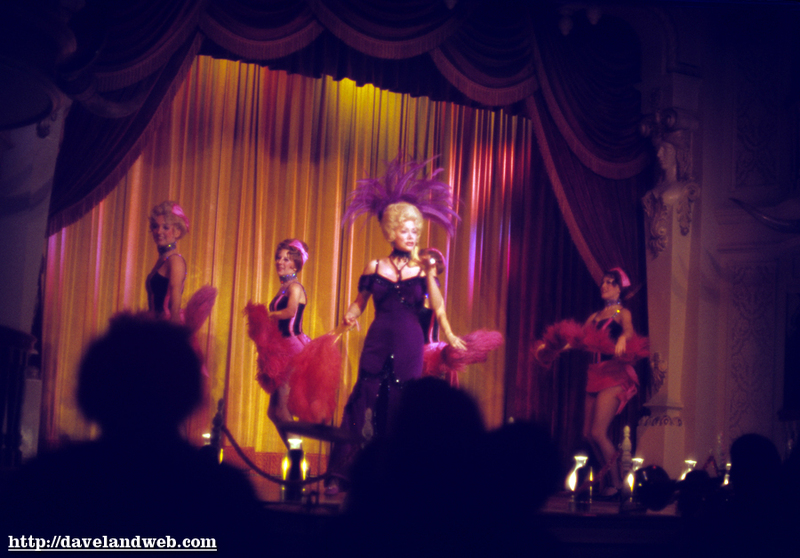 See more vintage and current Disneyland Golden Horseshoe photos on my regular website. 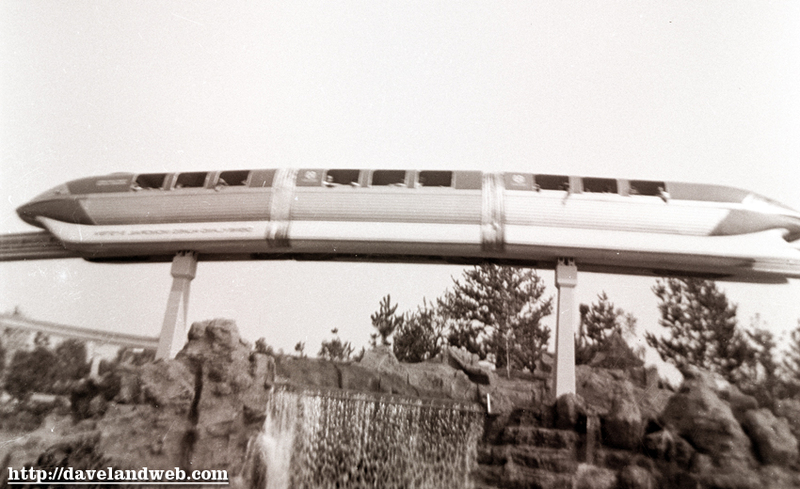 See more vintage and current Disneyland Monorail photos on my regular website. 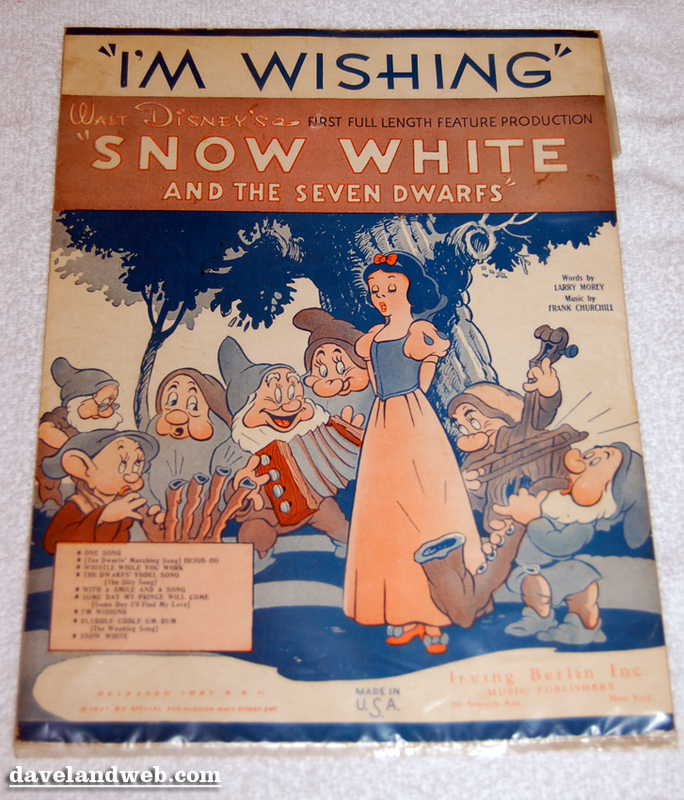 Today’s post is about the “Snow White” 70th Anniversary Event held over the weekend at DCA. 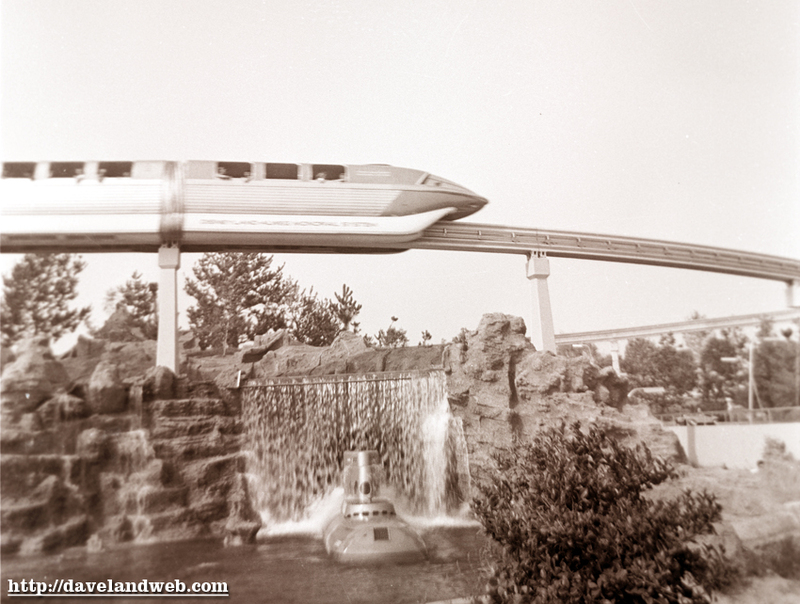 I figured it was time for a break from the House of the Future, and what better topic than that of the gal who saved the studio in 1937 and put Disney on the map with the big boys? 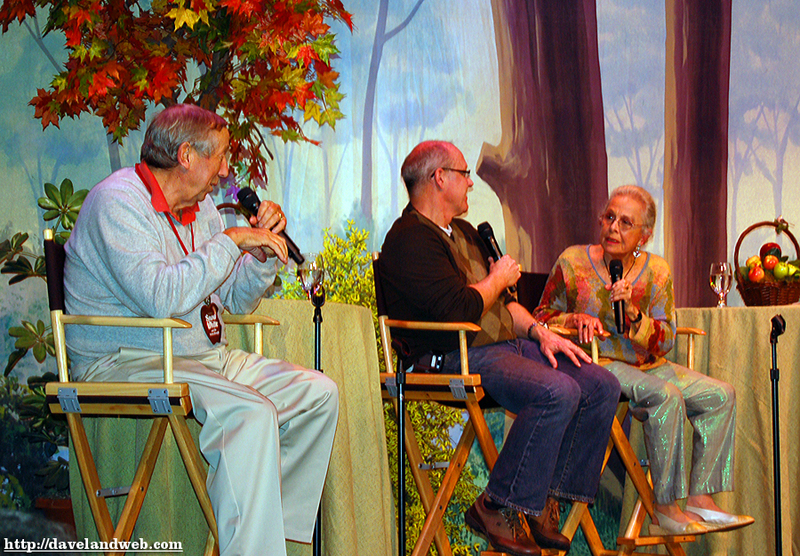 The panel discussion was fantastic; to have Roy Disney, Alice Davis, and Marge Champion in the same room was amazing. 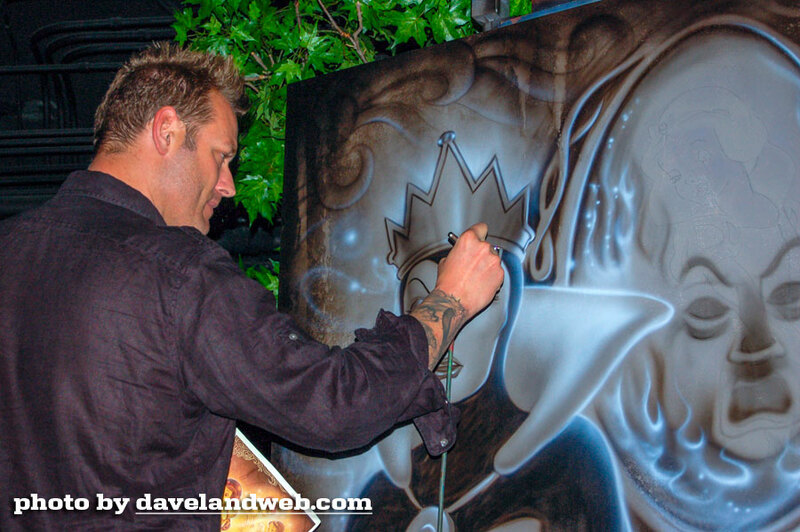 Before the discussion, artist Noah was on hand, airbrushing a painting of the Evil Queen, the Magic Mirror, and Snow White (who was only visible under black light). 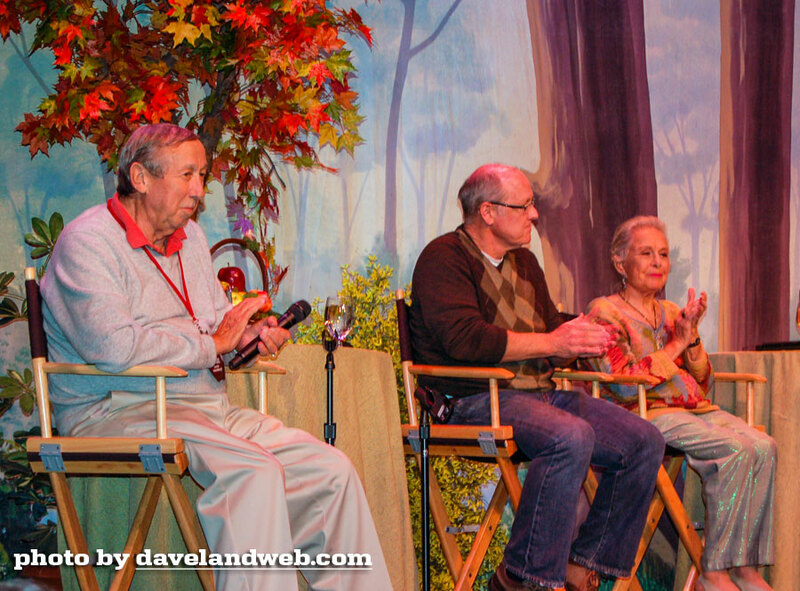 It was great to hear from Roy & Marge (Glen in the middle); Roy spoke of Walt’s amazing storytelling abilities, and reminisced how when he was a little boy, recovering from the chicken pox, Walt came to his room and told him the full story of “Pinocchio,” which was being made at the studio at that time. 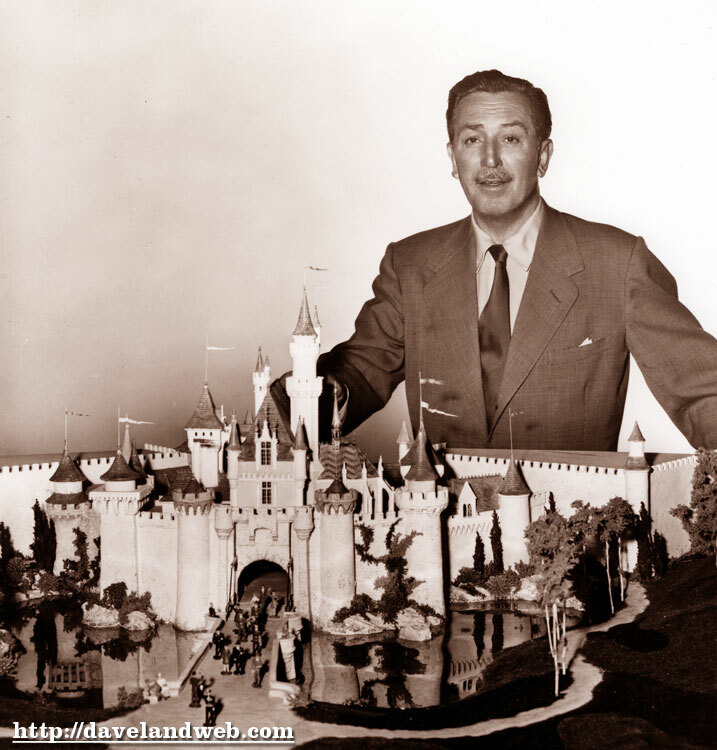 Roy said he spent at least 20-30 minutes, weaving the tale as only Walt could. 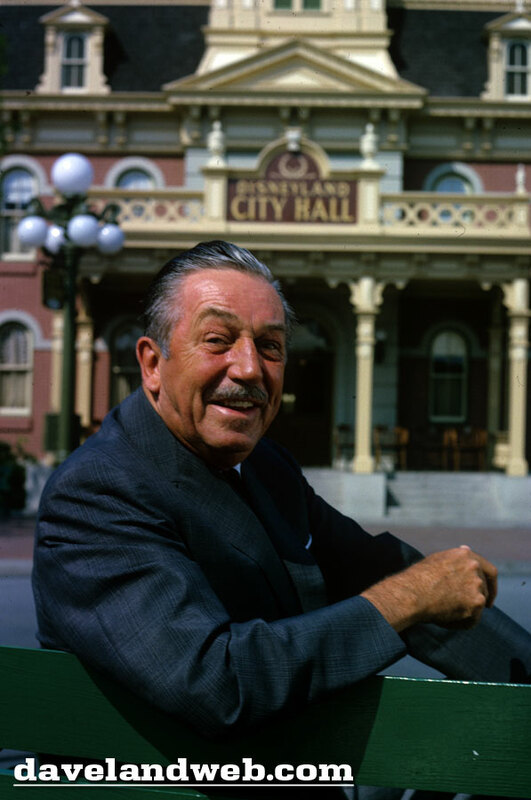 Roy also said how disappointed he was when he saw the film, because Walt’s version, told to him in his bedroom was much more exciting! Marge gave a few lively stories, and was probably the most fun of the bunch to hear from. 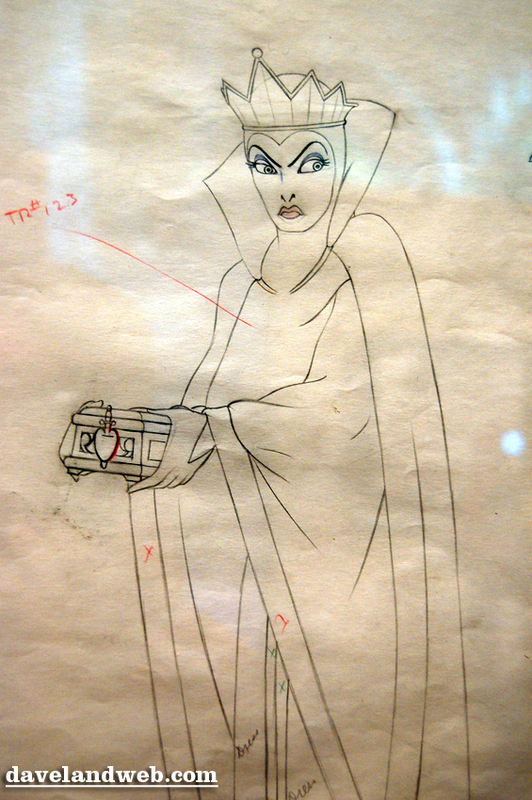 No publicity was given of her role in the film when it was released; Disney wanted to downplay the “tracing” or rotoscoping that was involved with the production. 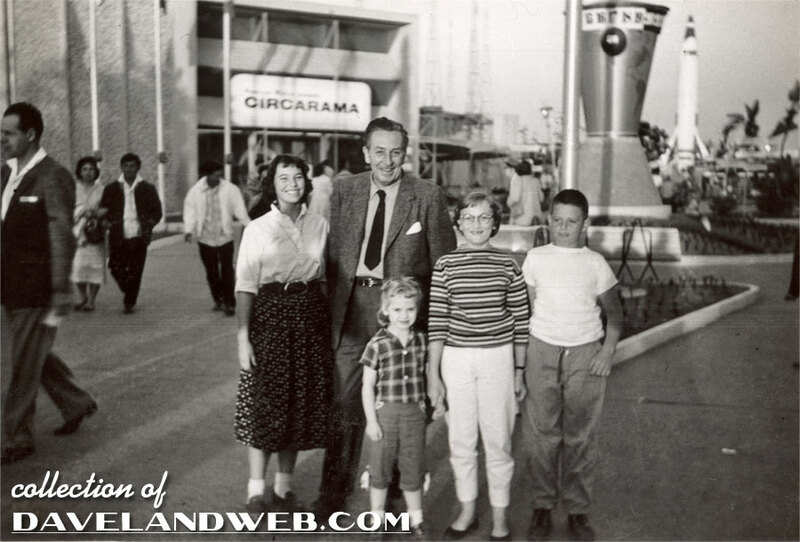 So, behind the scenes, beginning with her audition in 1935 at the age of 13, Marge danced (Walt wanted a dancer, not necessarily an actress) and emoted while the cameras captured her movements for the animators. 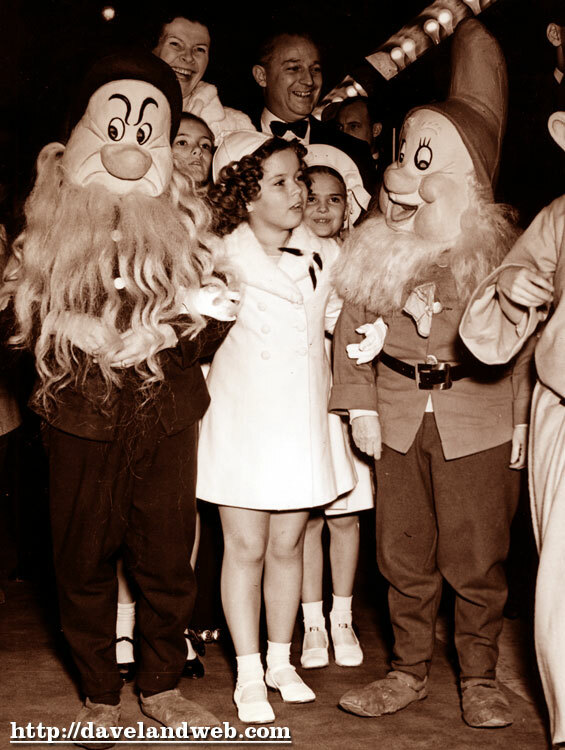 When asked about the premiere, she remembered being put up in the balcony, while Shirley Temple was down below, front and center. “She didn’t even have anything to do with the film!” “Damn Shirley!” commented moderator Don Hahn to audience chuckles. 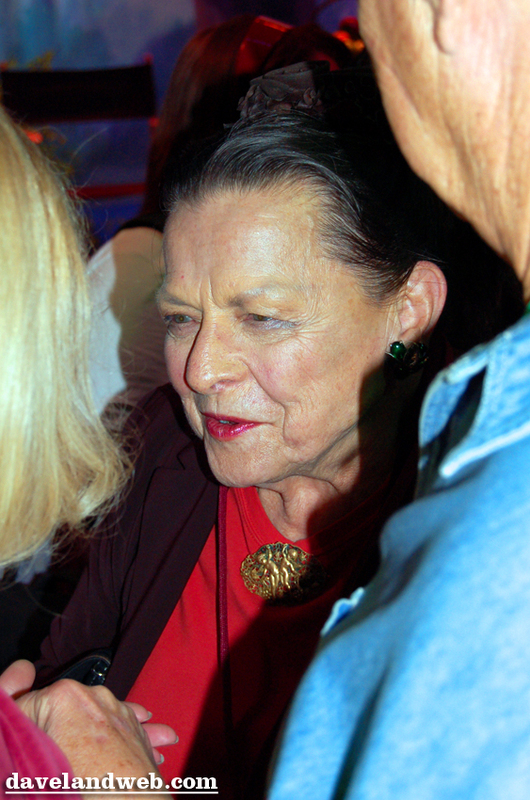 Disney legend Alice Davis was also there, sitting in the front row. 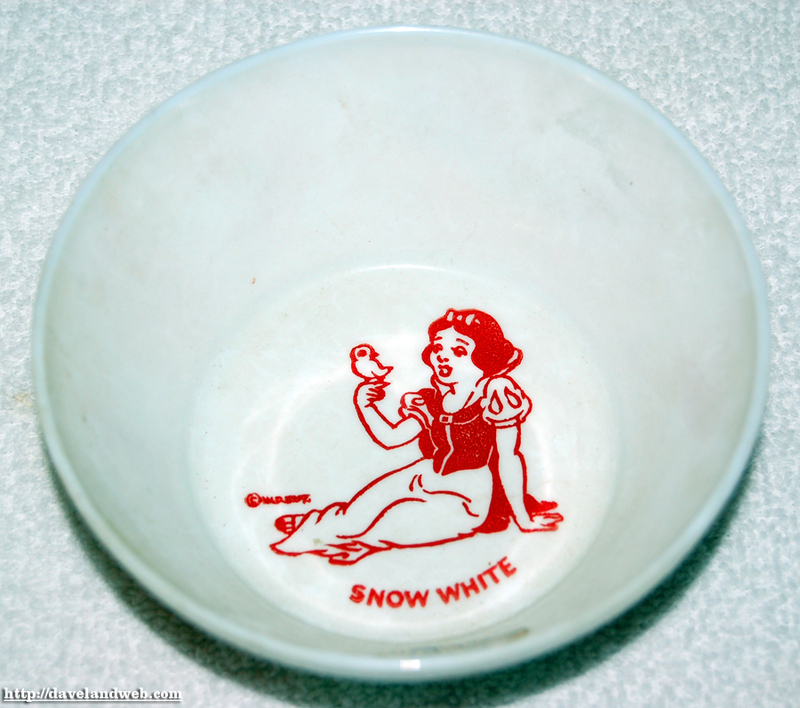 She took the mike a few times and told how “Snow White” was her husband Marc’s favorite Disney film. She also gave credit to Frank Churchill’s music, which was totally ignored the entire evening until Alice gave her kudos. 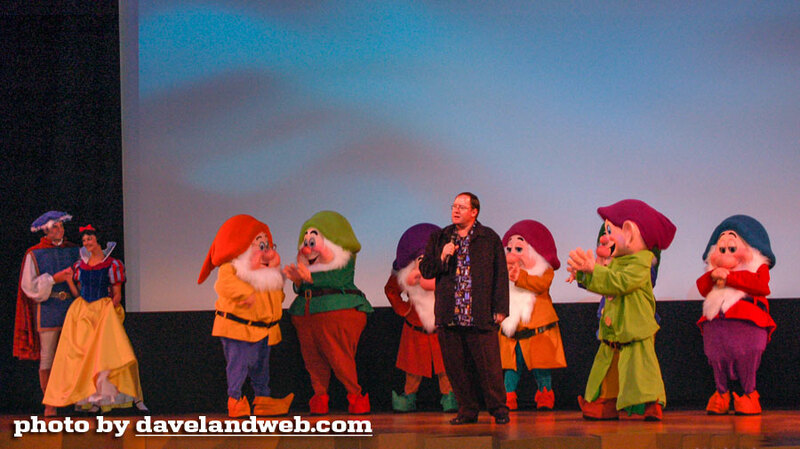 The movie was shown up on the big screen, with John Lasseter doing the intro. I must say that even 70 years later, the sound and picture still pack a wallop! In this day and age of digital and high tech, it may be difficult to comprehend how revolutionary this full-length feature animation movie was in its day, but it definitely was a phenomenon. 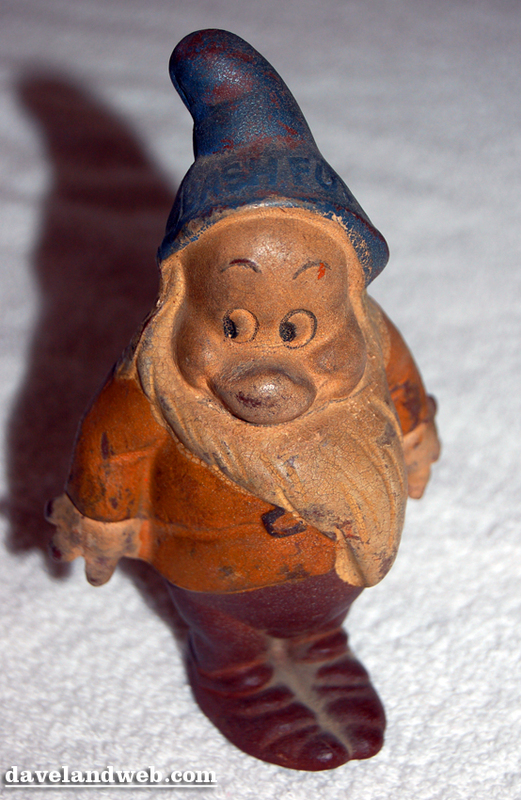 Merchandise was insane; bowls, sheet music, and figurines to name just a few. Many thanks to Mike Ellis for sharing his collection. 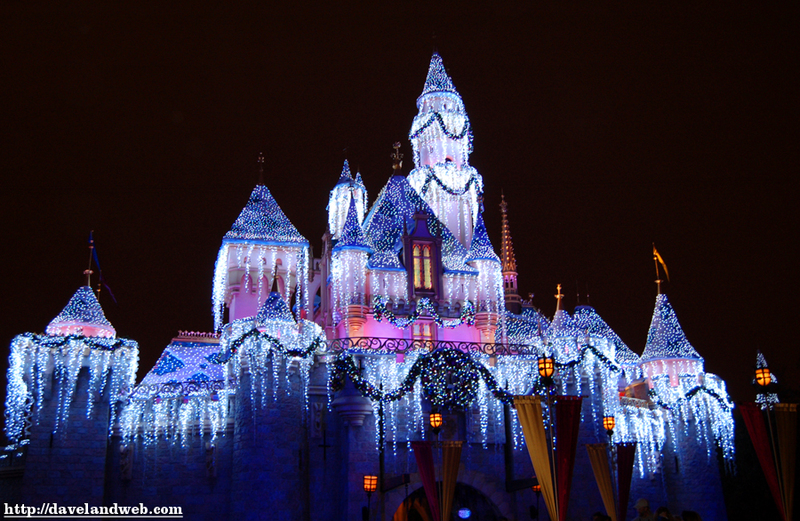 And although I do not like to think about Christmas until after Thanksgiving, the castle sure does look purty! Hopefully you enjoyed my coverage of Snow; back to regular biz tomorrow. 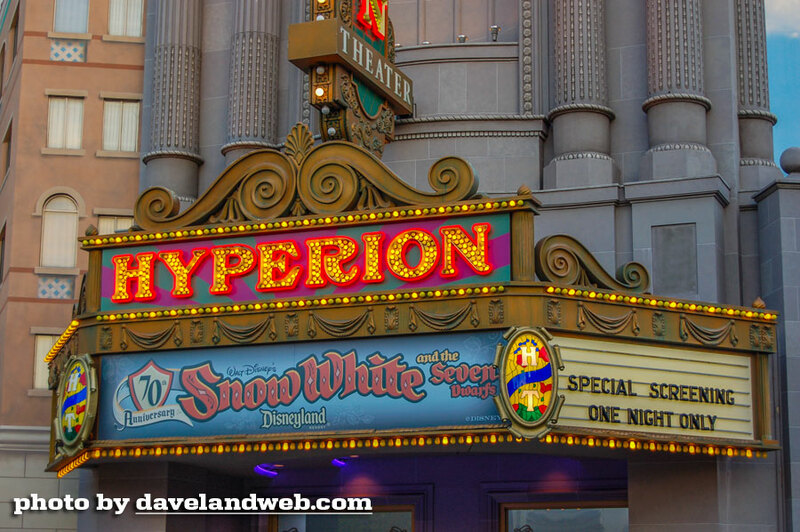 See more Snow White 70th Anniversary Event photos on my regular website. Monsanto House of the Future Blowout!